Unfortunately, the answer to this frequently asked question is ‘no’. 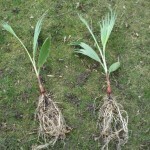 Palms cannot be propagated using the techniques commonly used for other plants in the garden. Taking a cutting will therefore not result in a new palm tree. Palms can only be grown from seed. Certain species do however form several foothills such as the Chamaerops. Such a offshoot can be cut off if it has sufficient roots of its own. But without its own root system, this operation is pointless. 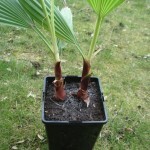 The palms sold in the garden centres are often several grouped individuals planted in one pot. This is because several seeds have been germinated on a small surface. The seedlings were then potted together. 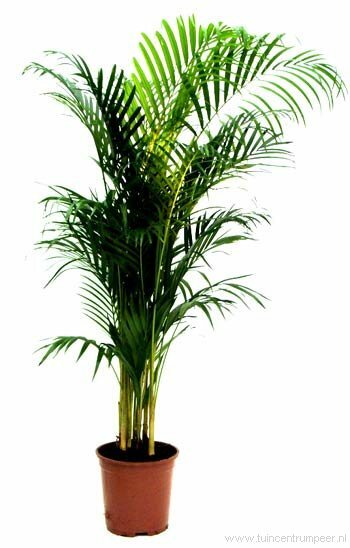 The best-known examples of this are the Areca and the Kentia. So every stem is in fact a separate palm. When each stem gets enough space, each palm would grow into an adult palm with a nice trunk. But of course it never comes to that point in the living room. For the enthusiast it is possible to separate these individual palms from each other. As soon as each palm gets sufficient space of its own, the growth will increase considerably. To illustrate the palms below. 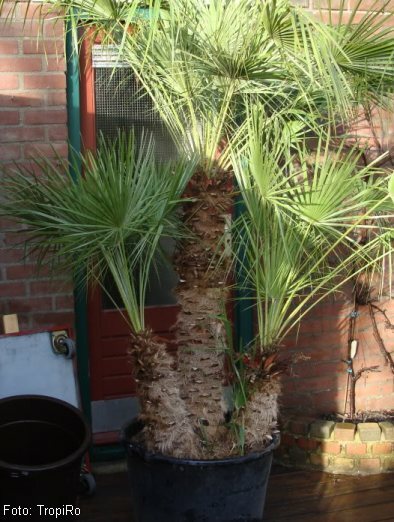 It concerns the Washingtonia robusta. The palms in the picture are equally aged (22 months). 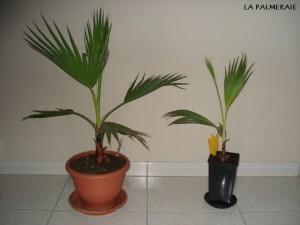 The palm on the right side has however shared a pot with a second one. As a result, it remained considerably smaller. Below you will find a step-by-step explanation of how the two palms (right) were divided. Carefully remove the palms from the pot. The roots have grown together enormously. 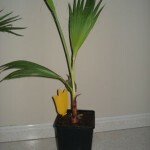 Pulling the root ball apart or cutting it would cause too much damage causing the palm to die. Rinse the root ball with lukewarm running water until all potting soil has disappeared. 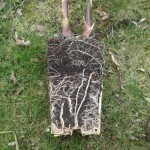 This also causes the roots to detach from each other. Unravel the entangled roots where necessary. Pot each palm separately. Try not to damage the roots. Provide plenty of water to ensure that the earth is properly coupled to the roots and the remaining air disappears.